Raspberries. White Chocolate. Honey. Almonds. I’m not sure it gets much better than that. I’ve been craving raspberries for a few weeks, I finally caved & bought a most definitely not in season basket full at the grocery store. I don’t regret it one bit. I've had a string of kitchen misses lately. I’ve made dry cookies, cupcakes with much too heavy frosting, and cornmeal muffins I spat out after one bite (which never happens! they were bad enough to justify my gross actions.). As soon as these came out of the oven, I picked at a corner of one and popped it into my mouth while it was still piping hot. I knew instantly I had a hit on my hands, even as I did a little "this is too hot, why I'd do that!" dance while fanning frantically at my mouth. Mix dry ingredients in a bowl. Mix wet ingredients in a bowl. Combine wet and dry until well incorporated. Gently mix in white chocolate & raspberries Pour into lined muffin tins. Bake for 25-30 minutes at 350F (or until golden brown). *you can buy pre-ground almonds or make your own. Like this post thanks for sharing this post. Such a delicious food to eat. Raspberries are my favorite. This looks wonderful! Yeah...you are right.I completely agree with your complement. Those look delicious. I love the bright and colorful raspberries. What a fabulou, fun, recipe. Love the almond flour. Yum! I'm so hungry right now, those look delicious. gorgeous. and they look amazing! Great combination and gorgeous photos! Looks really yummy. I bought a huge 5lbs bag of blanched almond flour off amazon, so I've been having so much fun doing loads of fun making stuff with almond flour and coconut flour. We had almond and coconut flour strawberry pancakes for dinner tonight. beautiful photos! the muffins sound delicious. gimme! looks so delish my friend. beautiful photos, delicious looking muffins. i have some raspberries in my fridge that i was going to serve with a lemon tart i was going to make... but on seeing these i may just assign half of them to this noble cause! yum! raspberry and white chocolate are my favourite muffins too. They are beautiful Hannah. Thanks for sharing! So sorry to hear about your mishaps this recently! I have experienced a few this week, I am blaming it on nice weather and a want to be outside enjoying sunshine! 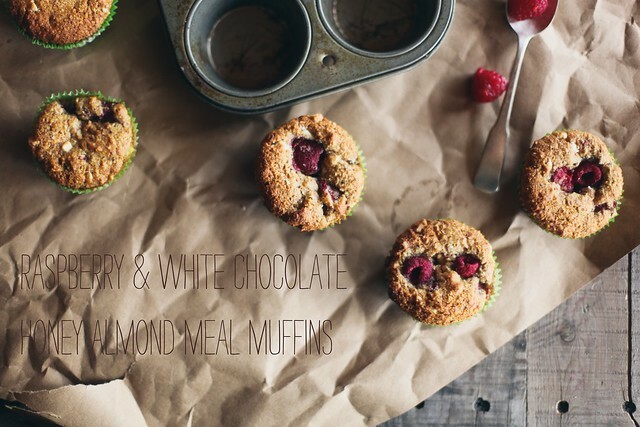 I hope these muffins get you back in your groove because I love your recipes and your posts! Thank you! My brother is on the specific carbohydrate diet - this will be perfect for him, minus the white chocolate! These muffins are lovely and looks wonderful! I totally understand your the temptation of buying out of season raspberries. Just today at the market I couldn't resist them either. That color is so inviting. Your photos are making it pop even more. Your muffins tick all the boxes for me! I will try them this weekend. Just went through about ten pages of your blog... such a lovely space you have. The recipes you post are SO delicious, while still healthy, which I love. These look wonderful...I've had the same out of season berry buying urges lately, maybe this is my excuse! Oh wow... These look amazing. I've seen the markets filling up with fresh southern berries this last week and I can't wait to bake with them! Ooh.. may have to try these. They look beautiful! My bf loves raspberries + muffins. These Muffins look soo amazing ! I love to read your blog, you have wonderful recipes !! These look so good. I tried getting some not so in season strawberries, and I was rather disappointed. Your raspberries look so vibrant, though! Have any of you guys tried to MAKE this recipe??? "pour into muffin tins? ", the gloop won't even fall off a spoon........where is the additional liquid to make the cake mix "pourable"????????? Never made muffins before that are soooooo heavy in the mixing bowl!! 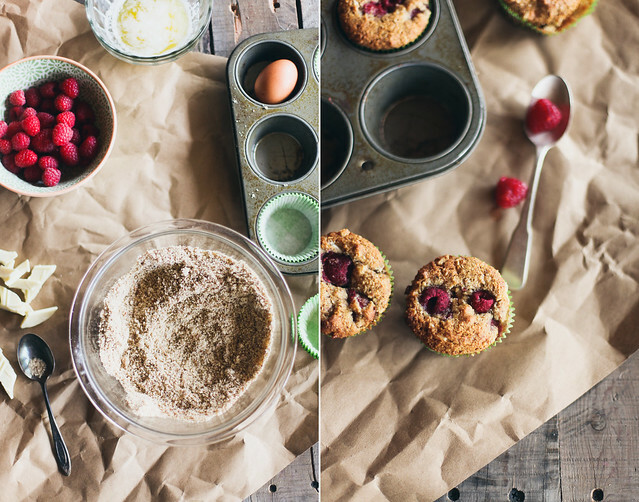 These muffins look awesome - and I can even make them for passover breakfasts! Yep, chocolate for breakfast. Yum! Those are some good looking raspberries...where did you find them? Amazing muffins btw...can't wait to try them! Oh!!!! what a perfect muffins!!!!!!!!! 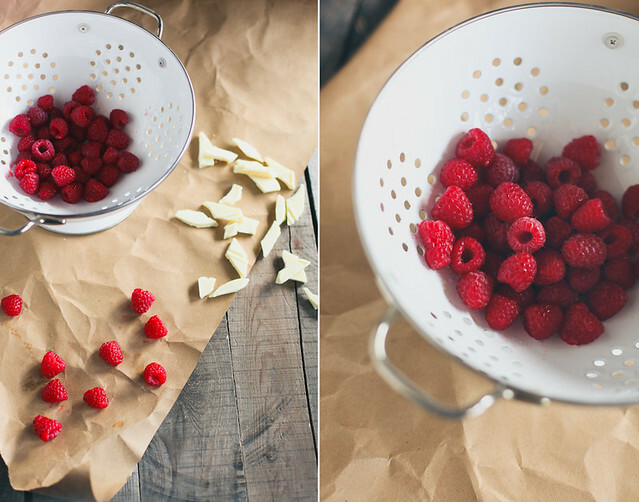 raspberries are mouthwatering!!! !beautiful photos as always!!!! OOh! I want some! Now if only I could take pictures like yours...! Maybe you should try the cornbread muffins (main ingredients are cornmeal and buttermilk) from Heston Blumenthal. The recipe is from "Heston at Home", but I'm sure you must be able to find it on the internet. In fact, I just found it here: http://www.channel4.com/4food/recipes/chefs/heston-blumenthal/chilli-con-carne-with-cornbread-muffins-recipe. The muffins are savory instead of sweet, and he serves them with chili. It's quite brilliant. I'm curious about your opinion, let me know how you found them. A burnt tongue seems like a small price to pay for such a lofty indulgence! I love the flavors in these muffins. These muffins look fantastic, will get the mrs to make some!! Thanks for posting! Not always a white chocolate person - but the berry combo is too much to resist! Thanks for sharing the recipe and the photos! I can't wait to try these! This is my first opportunity to visit this website. I found some interesting things and I will apply to the development of my blog. Thanks for sharing useful information. I think i'm going to ask my gf for this.. I love your recipes and I love your photos. You are the best! Wellcome on my food blog. 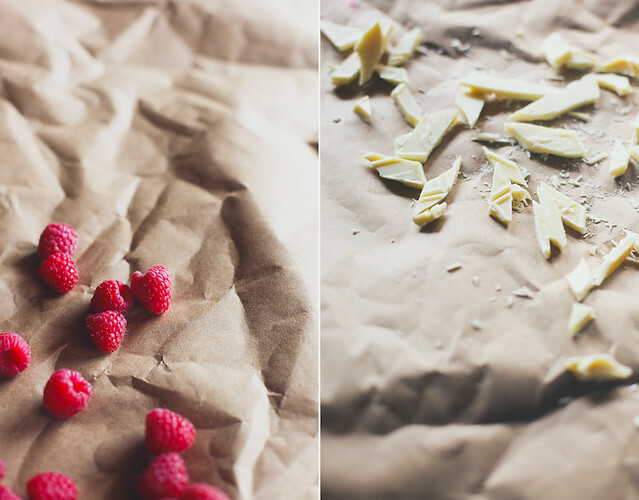 White chocolate and raspberries, yum! You combine beautifully art and food, because your photos are art :). Congrats and kisses. delicious and gorgeous. Not much in life is better than a good white chocolate and raspberry muffin! Ooh these look so yummy! I love baked goods that aren't too sweet. I posted my recipe for whiskey-almond pound cake and it's like that - just sweet enough. I'm definitely going to have to try these! I love that these are made with Almond Meal! They look yum and your photos are delicious! Such a fabulous recipe! AND It's gluten free! Awesome, my friend! Oj vad gott det lät, måste testa! Hello my dear-I adore your blog and I'm a new follower. Love the recipes and photos, going to try the roasted tomatoe soup! These look great! I love white chocolate. These look delicious. We too have been experimenting with muffins, bars and cookies, trying to make things without loads of flour and sugar. I love the use of almond meal. It adds a rich sweetness without the guilt. I'll try the white chocolate, sounds creamy and wonderful. Love Love Love your photos. This looks like a good addition to my weekend baking plans. My son will love this. your pictures are stunning.. new to your site, and i'm in LOVE! has a very rustic look. love it. Your blog and photos are beautiful, inspiring, soothing, like a cup of tea on a rainy afternoon. Thanks for sharing and inspiring us. I am so in awe of the pictures you post here. Thanks for sharing. Happy Sunday to you. Loving the font you used for the first picture. I was looking for it, and found it, then forgot the name! Yikes, I do remember it being like $18 though. Do you mind telling me what it's called? I'm sorry for any inconvenience! Excellent post. Thank you so much for this informative post. I will recommend it to all of my friends. with this ingredients they are making awesome things here.But to do this they have to follow some instruction and after that they will be able to make this at once. Your photography is amazing and the recipe sounds delicious. Does it matter what type of honey that you use? So simple, so delish! Thank you for all your amazing recipes! Great looking recipe- only thing is that there isn't a measurement for the white chocolate...should it be half a cup? I treat this recipe last night, brought them into work today and they were a big hit! simple, beautiful and delicious. I made them into mini muffins, it worked really well... thanks!! Hi………….. This is a great site. Thanks for sharing such a useful information. Real Estate Logo Design I was just surfing on internet and found your blog after reading this i realize that i should come here often. I wished to thanks in your time for this glorious read. I undoubtedly having fun with every little little bit of it and I have you bookmarked to take a look at new stuff you weblog post.Thanks for sharing!! Looks delicious after checking most of your recipes of which most of them are originally yours. Thanks for sharing such a useful information, I will be checking your blog for further information and updates. Thanks for sharing such a useful information, Provillus I will be checking your blog for further updates and information. Thanks for sharing such a useful information, Dissertation Writing I will be checking your blog for further updates and information. Very happy to see your article, I very much to like and agree with your point of view. My friend this such a nice and really informative post for me and others to work out and i want to thanks for that great post. Anyone can comment on blog but main thing is that comment is meaningful. I think comment also increase the reader Inters about that blog which is most important. I always learn something new when I come here, looking at photos and videos too, but I never have said thanks. Finally take the time now to say thank you and keep up the awesome work! It was my pleasure coming across your site recently. I got here right now hoping to come across new things. I was not let down. Your ideas about new approaches on this subject matter were informative and a fantastic help to myself. Thank you for having time to write down these things plus for sharing your thoughts. Nice information, many thanks to the author. It is incomprehensible to me now, but in general, the usefulness and significance is overwhelming. Thanks again and good luck.. Absolutely a wonderful publish. Worthwhile in addition to useful. Thanks when planning on taking fascination within the stated design. I am happy that i located versions post along with the info that you simply speak about from your document inside will be excellent. These kinds of data they can be practical for anyone. Maintain the beneficial operate intending. If you don't like the thought, however, you'll have the ability to prevent stop snoring through practicing a sideward sleeping position to widen the passage by which air might let you know. This passage is stuffed up after we sleep on our backs since our heads have to fall back. Additionally, our lower jaw is suggested to begin, therefore developing a space in which the tongue can droop back. In such a circumstance, the traditional airways will most likely be blocked by these elements. The anti-smoking organization SmokeFree Wisconsin has accused tobacco companies utilizing electric cigarettes as being a ploy to hook youths on these items. Everyone else claims these items are progressively being promoted to kids due to their being created in fruit tastes. Therefore, SmokeFree Wisconsin joins many other health groups in supporting efforts to get rid of electronic cigarette available on the market. I feel strongly about it and love learning more on this topic thanks for sharing. Hi, I'm so excited that I have found this your post because I have been searching for some information about it almost three hours. You helped me a lot indeed and reading this your article I have found many new and useful information about this subject. Thanks for sharing this! This is a really great post I found some really good information here I've got lots of followers on twitter and I will tell all of them about this as I really think it's great information that more people should see keep up the good work be back again soon. The web design is an activity that involves planning, designing and implementing websites. It is simply an application of conventional design, as it requires considering the navigability, interactivity,usability, information architecture and interaction of media such as audio, text, image, links and video. Now and then I suppose we have the conviction that provided that we utilize the statement "development" frequently enough, possibly we can truly begin one. Alternately we tangle developing mindfulness as "the development." While consciousness is indispensable and surely part of "development", if mindfulness doesn't prompt further movement, it is just a yelling into the wind. covering a all aspects of topic is such a difficult thing which you performed nice like gsm forum as well as me want to say about android Apps download which also did a nice job like a iphone apps on other hand how me can forget the amazing style of samsung galaxy ace buy which is adopted beautifully . I simply want to tell you that I'm new to blogging and honestly loved your web blog. Probably I’m going to bookmark your blog . You definitely have great article content. Many thanks for revealing your blog. Yummy...yummy... I cant wait anymore. Those appear delicious. I love the actual shiny and also decorative raspberries. Delicious food. I appreciate the information that you have provided in the post. It is worth noting and I really liked the presentation as well. I will surely come back for more of interesting posts. I basically want to tell you that I'm new to writing a blog and genuinely liked your web weblog. Probably I’m going to save your website . You definitely have excellent material articles. Many thanks for exposing your website. This article is well written and full of useful information. This is exactly what I was looking for. I would like more information about this. I was surprised by the spending of influence by those listed? In actuality I would have expected it because all are interested in getting what they wanted never mind the consequences. Very useful for me I will bookmark this for my future needed. thanks for a great source. An exceptional essence from you, Man. I have read your things before and you are presently too wonderful. High regard what you have got exact here. You construct it really enjoyable and you still run to keep it orderly. This is really a great blog thanks a lot for providing this information to all of us. I will be back soon. Thanks for your such an informative and lovely blog. I really appreciate you . Great stuff, This is something I was looking from so long, but every time I ended up struggling with useless information. ! You have jotted down the information in an organized manner and I would like you to keep coming with such educational pieces over and over again. This post is amazing for me to work out and also i like reading your post. This blog is really astonishing keep posting these types of informative blogs. I am very glad that I find your regular post here. Which seems to be very important and it made good time pass for me. I will always give a nice thrust look in to you from my bookmark feed. I don’t actually comment and don’t like to spend time in typing the comment. But here I have to do this because this deserves a good like.